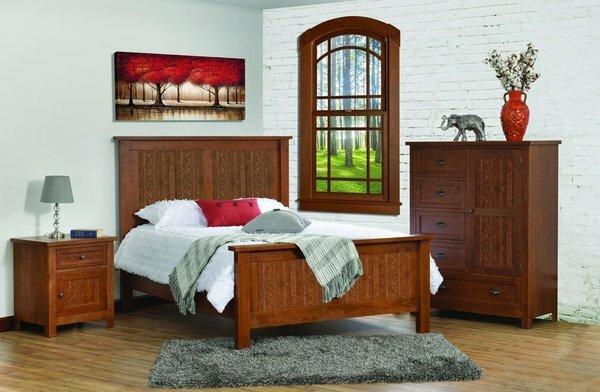 Welcome yourself to luxury living with a brand new Amish made bedroom set! The solid wood Timber Lake Bedroom Set comes standard with one bed in the size of your choice, one nightstand, and one gentleman's chest. Available in a wide variety of wood species and finish color options, you are sure to find the right one for your unique suite! There are six different bed sizes available to choose from. Your bed will be handmade and will provide you with endless nights of sound sleep. The nightstand has one drawer and one door with an adjustable shelf behind it for handy bedside storage. The gentleman's chest included in this set comes standard with a total of five drawers and one door with two adjustable shelves. All drawers on the case pieces are assembled using dovetailed joinery and affixed on full extension drawer slides for your convenience. Call or email one of our Amish Furniture Specialists today if you have any questions or if you would like assistance placing your order. Our toll free number is 866-272-6773 and our email address is Questions@DutchCrafters.com.